Funko And Make-A-Wish® Bring Joy and Generosity to Fans on Giving Tuesday | Funko, Inc.
EVERETT, Wash., Nov. 27, 2018 (GLOBE NEWSWIRE) -- Funko, Inc. ("Funko,” or the “Company”) (Nasdaq:FNKO), a leading pop culture consumer products company, in partnership with Make-A-Wish®, announced it will sell a limited-edition, Make-A-Wish branded vinyl Freddy figure online at gofunko.com/makeawish and at its retail store in Everett, WA on Giving Tuesday. “Make-A-Wish has been able to provide a priceless gift to children diagnosed with critical illness. Being a pop culture collectible company, we at Funko especially understand what it means to bring surprise and delight to a child,” said Molly Hartney, Chief Marketing Officer at Funko. “We are proud to support Make-A-Wish during the holiday season with our limited-edition Pop!,” said Hartney. 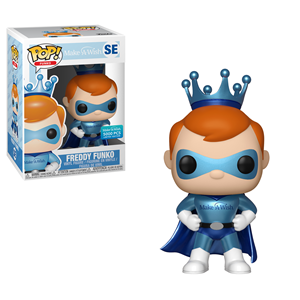 Proceeds from each Make-A-Wish branded Freddy Funko Pop! sold will be donated to Make-A-Wish. "We are honored that Funko partnered with us this holiday season to help make more wishes come true for children with critical illnesses," said Holly Thomas, vice president of corporate alliances for Make-A-Wish. "Right now, we are able to grant wishes for about half of the eligible children. We know this partnership will make a difference in many lives as it helps us get closer to our vision to granting a wish for every eligible child." Funko has seen first-hand the power of a wish while hosting Make-A-Wish recipients at their corporate headquarters and Comic-Con events nationwide. Product will be available until it is sold out and limited to the U.S. For more information on Funko, visit https://www.funko.com. Headquartered in Everett, Washington, Funko is a leading pop culture consumer products company. Funko designs, sources and distributes licensed pop culture products across multiple categories, including vinyl figures, action toys, plush, apparel, housewares and accessories for consumers who seek tangible ways to connect with their favorite pop culture brands and characters. Learn more at https://www.funko.com and follow us on Twitter (@OriginalFunko) and Instagram (@OriginalFunko). Make-A-Wish® creates life-changing wishes for children with critical illnesses. We seek to bring every eligible child's wish to life because a wish is an integral part of a child's treatment journey. Research shows children who have wishes granted can build the physical and emotional strength they need to fight their illness. Headquartered in Phoenix, Arizona, Make-A-Wish is the world’s leading children’s wish-granting organization, serving children in every community in the United States and in more than 50 countries worldwide. Together, generous donors, supporters, staff and more than 35,000 volunteers across the U.S., grant a wish every 34 minutes, on average, somewhere in the country. Since 1980, Make-A-Wish has granted more than 300,000 wishes to children in the U.S. and its territories; more than 15,400 in 2017 alone. For more information about Make-A-Wish America, visit wish.org.